This simple yet extensive-stage, with moderate slopes, provides a visual reward to hikers as they advance among vineyards and wide valleys and discover historical towns on this Jacobean route, such as Navarrete and at the end Nájera. The only downside to this pleasant route is that in summer the debilitating high temperatures, a problem that can only be fought in the recreational areas that mark the journey such as Grajera Park. Pilgrims will find no problem here to satisfy their hunger or thirst in one of the towns through which the road passes, and also in the small towns on route that provide services for walkers. After touring the monumental capital of Logroño (614 kilometres to Santiago), with all the historical references that make up this important city on the historical pilgrimage. Pilgrims leave on the long commercial street calle Marqués de Murrieta, one kilometre in length. To then turn left down Duque de Nájera passing two consecutives parks, the Laguna and San Miguel, which boasts one of the many little and ambitious sculptures that bears reference to hikers. On this occasion, two pilgrims are the main characters of this milestone by Óscar Cenzano, which was placed on a roundabout in 2005. Travellers say goodbye to Logroño, and its rampant urbanization area, via a comfortable wooded walk of more than two kilometres, which is accompanied by cycling lanes. Parallel to the main road, they reach the park of La Grajera (21 kilometres to Nájera), an area with a reservoir and a bar-restaurant, it is seen as a good place for pilgrims, especially in the summer, where they can rest between sun shades while having lunch at one of the tables in the place. Also for those suffering from any health problems, there is a First Aid station nearby. Although, the water in the reservoir may look inviting there are a number of signs warning that swimming is prohibited. This place also conceals during the summer months one of those people who, with his charisma and good attention to the pilgrims, has managed to "sneak" into several guidebooks. Marcelino is a neighbour that offers souvenirs and the stamp for the Jacobean credential. The route then continues along a track with a slight slope just over a kilometre in length. 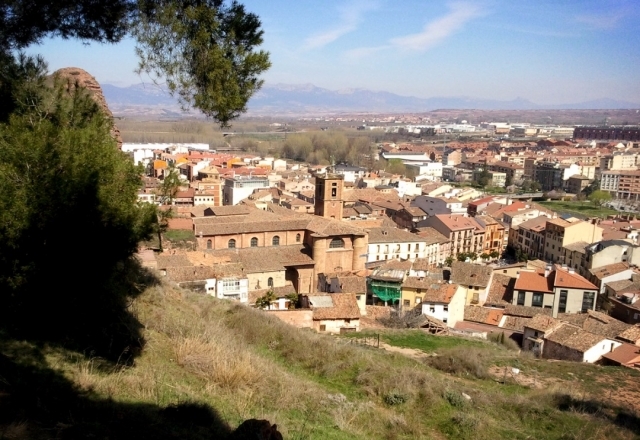 At the top of Grajera, walkers are greeted with a great view over Logroño. The hiker continues parallel to a metal fence, which pilgrims have covered with a number of wooden crosses (a tradition extending along the entire pilgrimage route). The route crosses the N-120 and subsequently continues between vines on a dirt track to an overpass that crosses the A-68. The traveller then heads to Navarrete though, before arriving, goes through one of the many wineries in the area and passes the ruins of the hospital of San Juan of Acre, founded around 1185 as a shelter and aid for pilgrims. Archaeological excavations conducted in 1990 allowed them to locate the main walls of the old hospital, which had a large church with a Latin cross and a round tower with a spiral staircase. Following this discovery, the hiker reaches, after ascending a few stone steps, Navarrete (Nájera 15.4 kilometres), a town famed for its pottery and Jacobean past where they will find a diverse range of catering establishments and three hostels, two private and one public. At one side, there is the monumental church of the Asunción and a number of houses and medieval palaces, well worth visiting. 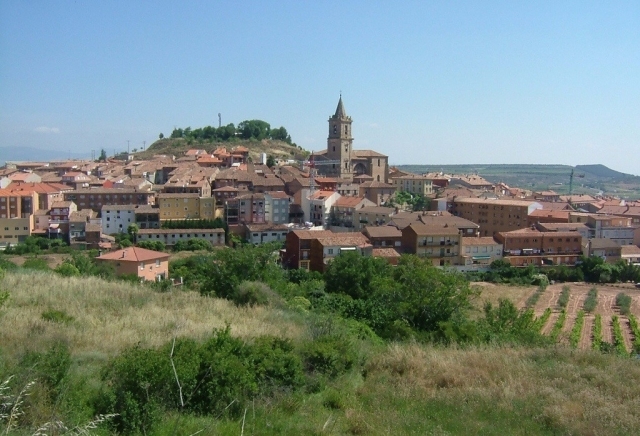 The route crosses the city centre via Calle Mayor Baja, and continues along Calle Mayor Alta and Arrabal, from here the route, once again joins the N-120. The road is reached this time on its left side and arrives at a cemetery and a chapel with a roman door, flanked by two windows of the same style, originally this temple belonged to the pilgrim hospital San Juan de Arce. In one of the capitals of the pillar there are two seated characters. One raises a glass while the other eats and holds a staff. There are those who identify this scene, as demonstrating the vital stages of pilgrims, while for other historians the main characters are shepherds. Before continuing the hike, many pilgrims stop and read the plaque that is above it, placed here in memory of all the pilgrims who died on their way to Santiago and, especially to pay respect to Alice de Crae, who died in 1986. From here the route moves to the left and the track changes from asphalt to a solid dirt track that is continued for one kilometre, ideal for cyclists who pass between vineyards and on good ground. On arriving to the area of Cooperativa Vitivinícola de Sotés the route crosses the road that leads to the village, over a kilometre away from the Jacobean route although hikers that need any type of facility can go into the village and will find a bar, restaurant, shop, chemist and the private hostel Bodega Fernando J. Rodríguez. But, as anticipated, the route avoids this enclave and continues ahead on a wide track and on good ground that leads to the A-12 and runs parallel to the motorway on its left hand side. After an interval, and passing under the road, the route arrives at a crossroad where they are directed to the left. There are also directions to the hostel Ventosa, although the sign is a little confusing. Another place situated little over a kilometre from the route but which also provides help for those who need it or want to stop (here you will find the hostel San Saturnino, several bars, and a restaurant that sells sandwiches and reasonable priced meals). The route, however, does not run directly through this stop, rather it continues, passing a picnic area and arrives a little later at a junction with the LR-341, somewhat dangerous, as there is no pedestrian crossing. 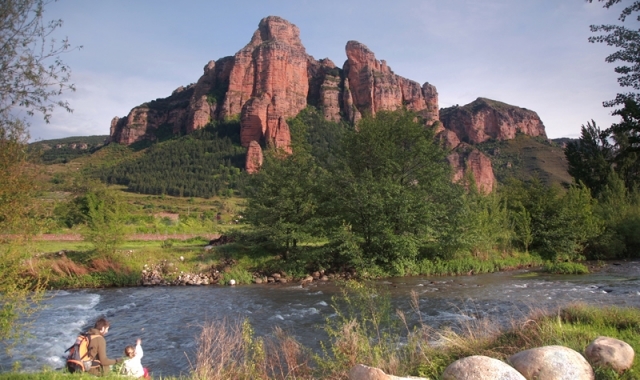 The road continues through stone ridden areas, sometimes rocky, and flanked by curious mounds of pebbles. At a steady pace, but without much effort, the route climbs gradually to Alto de San Antón (located 670 meters and 7.1 kilometres from Nájera), a hill with panoramic views, allowing hikers a glimpse of the clay landscape, the extensive valley of Najerilla and the still distant Nájera. After leaving on the left hand side the winery Dinastía Vivanco, the path descends to an underpass, which crosses the N-120 and continues on a dirt track. The hiker leaves on the left the imposing Sierra de la Demanda, on which the peak of San Lorenzo (2271 meters) stands out, while approaching an antenna that according to history is also the site of Poyo de Roldán (3.1 miles Nájera). On this hill its said that the battle between the giant Ferragut and the knight, nephew of Carlomagno took place, whose adventures have become a landmark on the Camino de Santiago and the reason so many French pilgrims visit these places. On this occasion, legend claims that Ferragut was a Muslim giant from Syria, whose main characteristic was his strength, bravery and invincibility. Carlomagno, knowing of his existence went with his troupes and proposed a battle. After many failed attempts by the French paladins, Roldán himself asked permission from his uncle to challenge the giant. They fought for two days without reaching a truce, however, they were unable to name either as the winner. For this reason, on the second day, they decided to rest to recover their strength. During this time, they began a conversation about Roldáns' faith and Christian religion. At this moment of friendship, Ferragut confessed to his rival the secret of his invincibility, which was that he could only be injured in the navel. After finishing their rest Roldán stabbed his dagger into the navel of his opponent, killing him and putting an end to the fight, thus winning it for Christians. The iconographic representation of this theological battle between two religions can be seen in the capitals of the two Roman pillars in Navarrete, similar to the one in the Palacio de los Reyes in the town of Estella. The journey continues passing some viaducts that join the motorway and continue along a path that reaches the bridge over the river Yalde. From here the route takes a path for almost a kilometre and a half until reaching a recreational park, Poema del Camino. Soon after, the pilgrims face the last challenge of the day, a dangerous junction with the N-120 without a pedestrian crossing. Although well signposted, extreme caution is recommended. Despite signs announcing the entrance to Nájera, the pilgrim still has to walk a kilometre and a half before reaching the centre of the town and the hostel itself. Even then, and as motivation, one of the houses has a welcome sign for the pilgrims and invites them to feel at home ("Pilgrim in Nájera, najerino"). After passing a sports centre and along the Avenida de Logroño and Avenida de San Fernando, the pilgrim reaches the bridge over the Najerilla river, this bridge was allegedly built by San Juan de Ortega (one of the biggest supporters of the Camino de Santiago). Just cross over and rest. This easy step does not present much difficulty for cyclists. Even the exit from Logroño towards the reservoir of Grajera, a cycling lane invites them to continue the route. Only a few uphill climbs, a descent from the peak of San Anton, and a stone path, may make the route a little difficult. 1 reviews Distance to Santiago: 614 km. 2 reviews Distance to Santiago: 587 km. 1 reviews Distance to Santiago: 602 km.